Yesterday provided more warm sunshine for local soaring but unfortunately no wind. 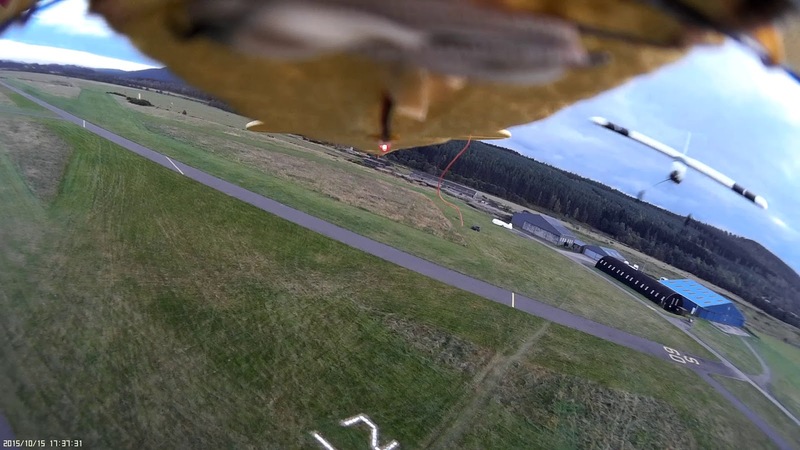 However, it was ideal for Phil B to do his first Aboyne solo, getting neatly to the end of runway 09 in 319. It was also ideal for a bit of photography. Later the models came out for more experiments with cameras. This provided documentary evidence of an airprox between a Cub and a WOT 4. A lovely day in Scotland but no wind. More site checks in the Duo. Plenty of tea drinking and sitting in the warm sun watching the flying. In true Booker expedition style, once the gliding finished the model aircraft came out. Glyn demonstrated the new Wot 4. 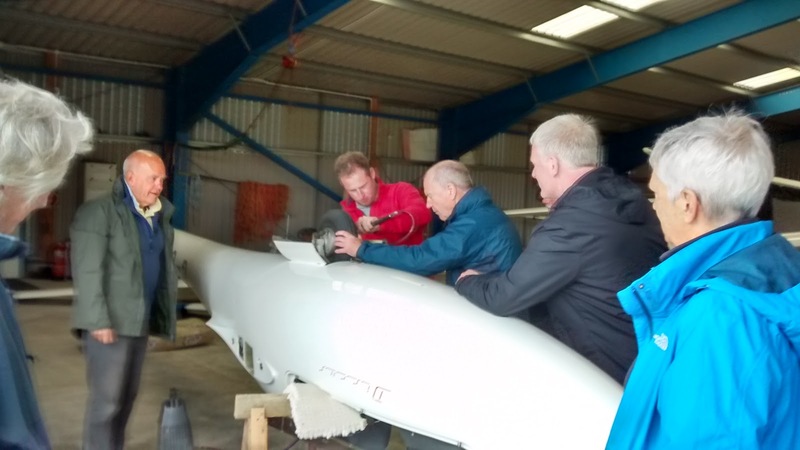 A few had a go at flying the Cub by watching the pictures transmitted from the camera mounted on the nose; it is still in one piece. Check out the video. Some entertaining North Westerly wave today. Dave and Graham (315) started off in the wave around 08:30 (i'm not really sure of the exact time as I was still in the cottage putting on my washing). Denis and Geoff got well above 10,000 Ft, but most of us tootled between Cambus O'May and Ballater to heights of around 6,000 Ft. Very moist air meant occasional showers to dodge and gaps that kept closing, but that added to the fun. Many more wave flights for the new arrivals with the last 315 landing at sunset. Many Booker pilots in Scotland now, so probably time for a roll call; most of us flew today. Terry C, Glyn R, Bob D, Bob S, Roland W, Nick H, Nick J, Jane M, Jane & John W, Dave B, Richard C, Boris B, Ed D, Phil B, John H, Denis C, Geoff T.
A group curry this evening at the Lochnagar Restaurant to round off the day. Typical view of the cloudy gap over Kinord and Davan Lakes today. This is where the wave was today. Pic from 315 taken directly above Cambus O'May towards airfield. The weather this morning was indifferent so one contingent set off via Banchory down a very scenic road to Stonehaven, which is usually the place you drive through on the way to Aboyne. It's worth stopping for a look around. Apart from being the birthplace of Robert William Thomson, inventor of the pneumatic tyre (who knew? ), it is also the birthplace of a famous Scottish delicacy. However, the object of the exercise was Dunottar Castle, reached by a 2 mile walk along the cliffs past curving bays of black sand. Perched on the cliff edge, it's a spectacular site and well worth a visit. The wind had got up by the time we walked back, it was a bit chilly and we'd missed lunch, so the Harbour Hut cafe was a great find, excellent cake, very reasonable prices and friendly service. The clear sky last night guaranteed frost this morning and a bit of car scraping, but the early morning mist in the valleys and the frost on the heather was lovely. We had to wait a bit for the mist to clear, and we could have done with a tad more wind, but there was undoubtedly wave, though the windshear made it a bit more interesting than usual, and with every glider launched it required close attention to look out. Various dinner options were discussed - one contingent went to the Boat, one on a fish, chips and mushy peas expedition and the third heading for the Co-op's ready made curry section. We have also received in the post an oximeter from Nick Newton who knows about these things, so tomorrow we will be practising not breathing, to see if we can replicate high altitude flying. Last night the sky cleared and there was talk of the aurora borealis being visible from the UK. Most of us went to bed, but Bob happened to be up in the small hours and took some pics of strange lights in the sky. This morning we were up with the lark and soon rigged and ready to go. Unfortunately the wind wasn't quite strong enough to provide more than a bit of elusive weak wave but there were plenty of thermals and some excellent views. 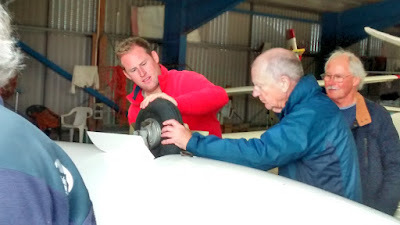 Graham (C6) did his first solo at Aboyne in his own glider - well done Graham. The turbo gang - Richard (FI), Geoff (GA) and Denis (370) went to Tomintoul and the Lecht - so nice to have the reassurance of an engine - and then set off over the high ground towards Braemar. They made it over the high stuff, arriving in Braemar low enough to have a good look at the castle and other local sights. Denis and Richard fired up their engines, but Geoff had to land in a nice field by the river when his failed to start. He was soon safely back at Aboyne thanks to an efficient retrieve by Richard and Nick. Post flying entertainment was provided by Glyn with his Radian model which soared effortlessly in the convergence over the airfield. 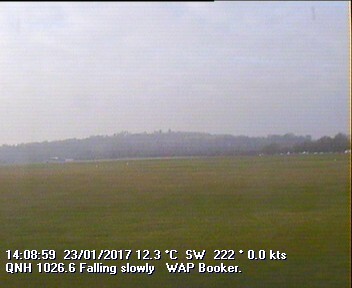 Bob tested the new installation on his Cub, a camera providing a pilot's eye view of the flight transmitted to a laptop. Presumably he's training for a second career in drone flying. What was that about minimising drag? Our welcome to Deeside was as warm as ever and indeed Sunday's weather was also pleasantly warm with excellent thermals so we had some very good soaring over the local area with check rides for some. William (LC) had a less good day as he discovered a flat main wheel. Further investigation over the next couple of days produced more complications, not much fun when it involves lying under the glider in wet grass. However, today the combined might of BGC fixed the problem ready for the good weather we are promised for tomorrow. Dinner this evening at Clearfield was roast beef and Yorkshire pudding. At Birkelunn they are probably missing Rolf's expertise in the dessert department but we understand that they are dining well. Take a deep breath Nick, that's quite a lot of candles! Happy birthday to Nick Hoare! The annual Booker expedition to Aboyne gets underway with a birthday celebration.